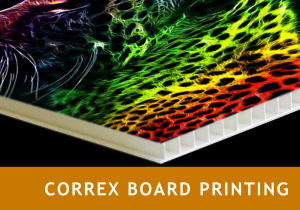 Correx Boards are also known as corrugated board. Correx Boards are affordable, lightweight, water-resistant and multipurpose sign board suited to outdoor short term signage often used for display boards or advertising boards. Correx boards are an extruded twin wall fluted/corrugated polypropylene sheet and offers effective solutions to a wide variety of applications. It is ideal for many kinds of sign displays and advertising applications. Colours that are available vary between suppliers and usually include a variety of spot colours and the four Process colours: Cyan, Magenta, Yellow and Black. Same day Full Colour Correx Boards printed from a minimum of 50, go bold, go full colour, promote your event or business.